Celebrated by the whole Christian world, Great-martyr George was slain by Emperor Diocletian in the year 303. The majority of Georgian churches (in villages especially) were built in his honor and, as a result, every day there is a feast of the great-martyr George somewhere in Georgia. The various daily commemorations are connected to one of the churches erected in his name or an icon or a particular miracle he performed. 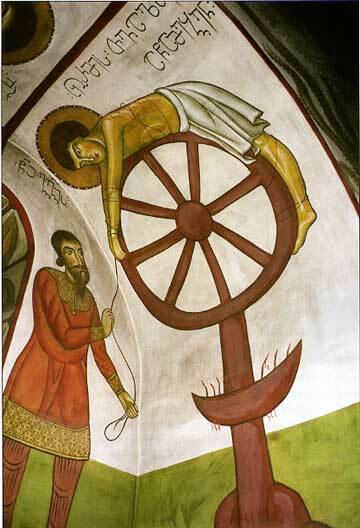 November 10 marks the day on which St. George was tortured on the wheel. According to tradition, this day of commemoration was established by the holy Equal-to-the-Apostles Nino, the Enlightener of Georgia. St. Nino was a relative of St. George the Trophy-bearer. She revered him deeply and directed the people she had converted to Christianity to cherish him as their special protector.